The Green Party has pioneered the co-leadership model which has helped us provide representative and dynamic leadership. We think the time has come for further innovation, said Green Party Co-leader Dr Russel Norman. We will be introducing a more inclusive model of leadership that covers youth and rainbow representatives, said Green Party Co-leader Metiria Turei. The Green Party is launching today a broader leadership model that will include male and female youth and rainbow co-leaders. The additional co-leaders will be Holly Walker, Gareth Hughes, Jan Logie and Kevin Hague. 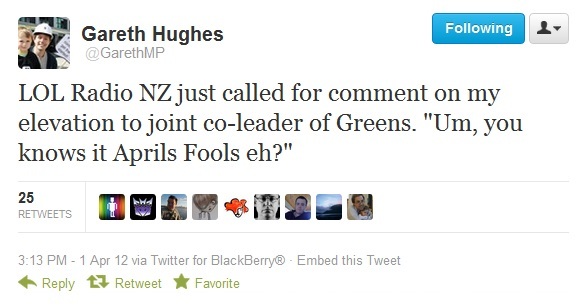 “This is tots gangsta man, I’m gonna tweet this everywhere, said Green Party Co-leader Gareth Hughes. Initial research by the Parliamentary Library suggests that if there is direct correlation between the number of leaders and voter support then the Green Party support will expand 3 fold from 11% to 33%. “This is great research, if this works out we might need to expand the leadership again – I can’t think of any more new categories for leaders but I will consult with the Party, I’m sure they will come up with some,” said Green Party Co-leader Dr Russel Norman. “If the other petals of the party takes up this structure up we will have 18 co-something’s that will make us pretty much invincible I reckon,” said Green Party Co-leader Metiria Turei. At least I don’t have egg on my face…like RNZ. Well played Greens…I’ll see you on the battle field next April 1st.